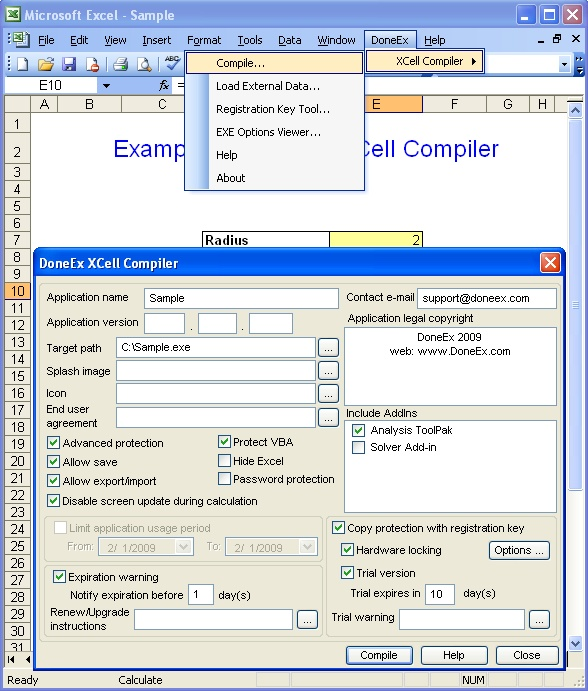 UDM Downloads > DoneEx XCell Compiler! Compile MS Excel spreadsheet into EXE application (which requires MS Excel to run) with securely hidden formulas. The complied EXE securely hides formulas in binary format and protects your algorithms from being copied. XCell Compiler offers very easy and hassle free excel file copy protection. With its registration key/license management feature you can protect your excel application from illegal copying from one computer to another by using hardware locking mechanism. It offers you to add your own splash, end user license agreement (EULA). Main features are: - Compile your XLS file into an application (EXE File). - Securely hide formulas by converting them into binary format. - Create registration/license based application. - Hardware locking! Lock your excel application to target computer. - Royalty free distribution of your compiled EXE. - Excel application copy protection, illegal copying from one computer to another. - Restrict the time period of usages for your application. - Save/Load changed data from/to compiled EXE. - Restrict the access only to authorized individuals, and limits users activities to the minimum required, for business purposes. - Eliminates the chances of exposure of corporate secrets, breaches in customer confidentiality, and the disruption of business activities. - Prevents information from being altered in an unauthorized manner. - You can add your own splash screen, while compiling. This will give you a chance to advertise your own company name. - Install your Add-ins (XLA files) on your customers computers. - Add your own application name, version and copyright information. - Add your own end user license agreement information. - Simple and effective protection procedure, no need for additional programming. - Trial version feature, Easily create demo version of your excel application, with date limitations.